There is one room in my home I somehow continually succeed in avoiding. And that would be my laundry room. 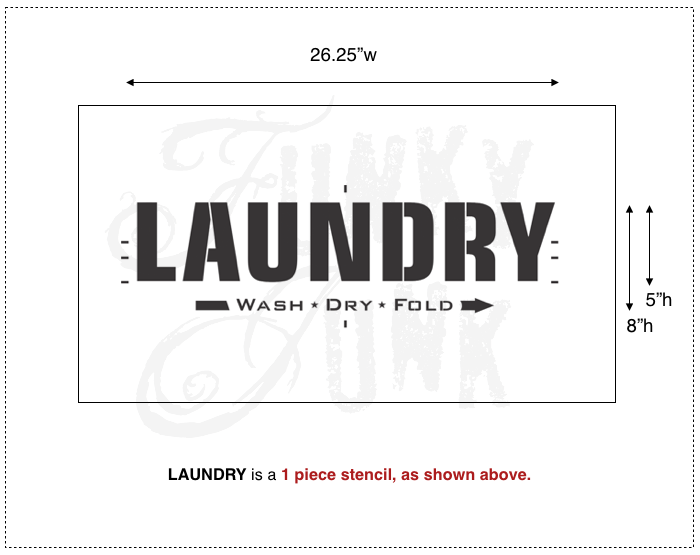 So when the requests kept coming to bring a LAUNDRY stencil design to life, I knew I had my work cut out for me. As it stands, the room wasn’t ready enough to try this new creation out. But that doesn’t mean I can’t plan ahead for it! 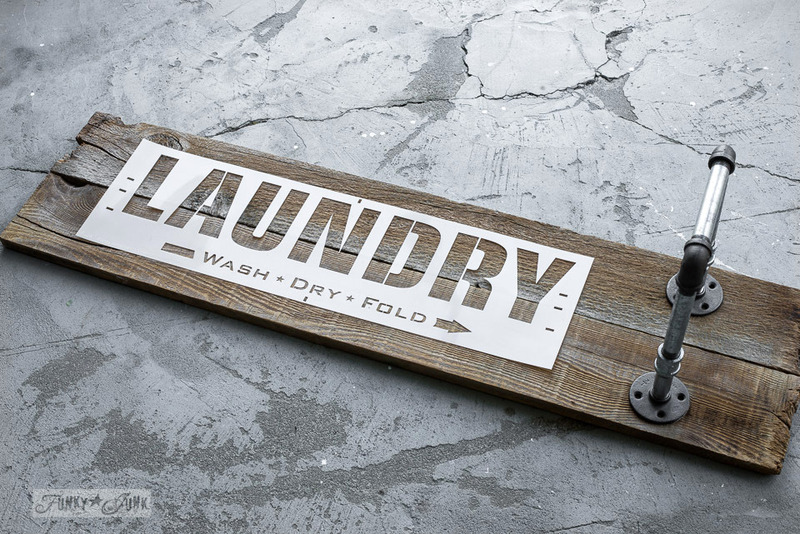 Space is tight in my laundry room, so this mini reclaimed wood and pipe LAUNDRY sign hanging station won for me! I could also see this idea working in a bedroom or bathroom! 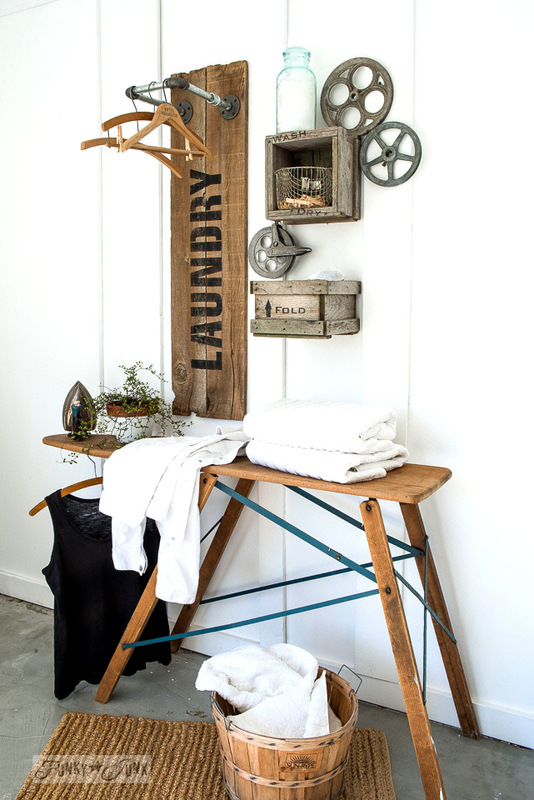 But here it is, laundry room style. The big, bold timeless letters help you to create old style whimsey in your own (hopefully finished?) 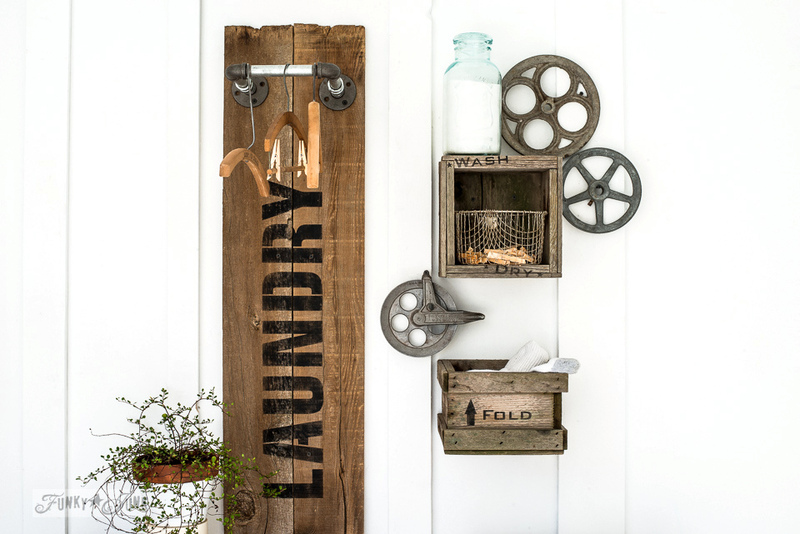 laundry room! The subtext morphs the stencil into a market sign, which was designed to be easily taped off if simple is more your choice. Middle and alignment registration marks help guide your positioning with ease. pipe fittings – I used 3/4″. 1. 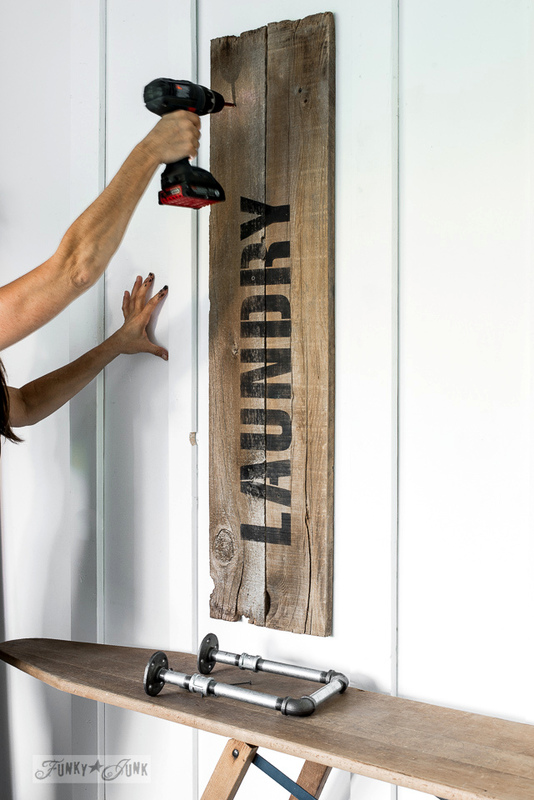 Dry fit your idea on some reclaimed wood before any painting or wood cutting takes place. This is where I like to imagine and play. Either horizontal or vertical would work! 2. Cut your wood to suit, then lightly sand. I used reclaimed fence wood that had been previously pressure washed. I also like to attempt to keep the edges natural if possible. 3. Position your stencil where desired, and masking tape into place. Tip: Tape over registration marks and any subtext you don’t desire to paint. I personally had other plans for the subtext! * Both boards are loose here. They were never attached together. 4. 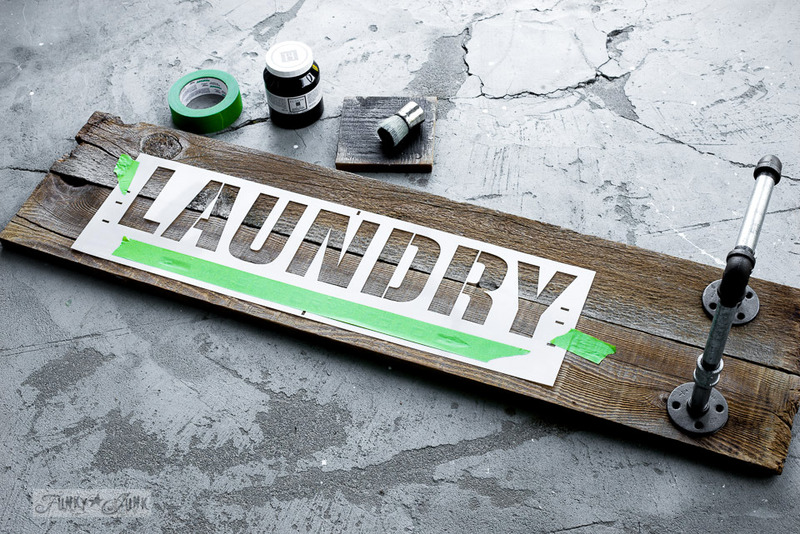 Load your stencil brush with paint, but remove most of it before tapping it over the letters. 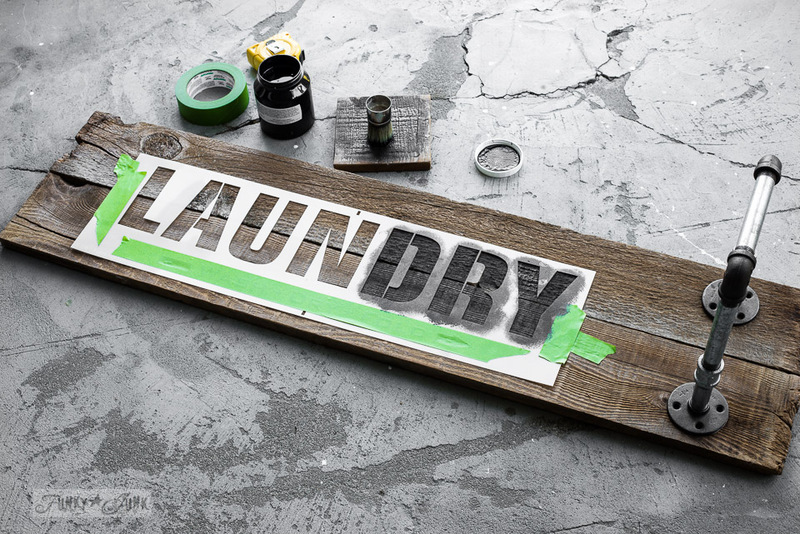 A dry brush is the key to sharp letters. 5. 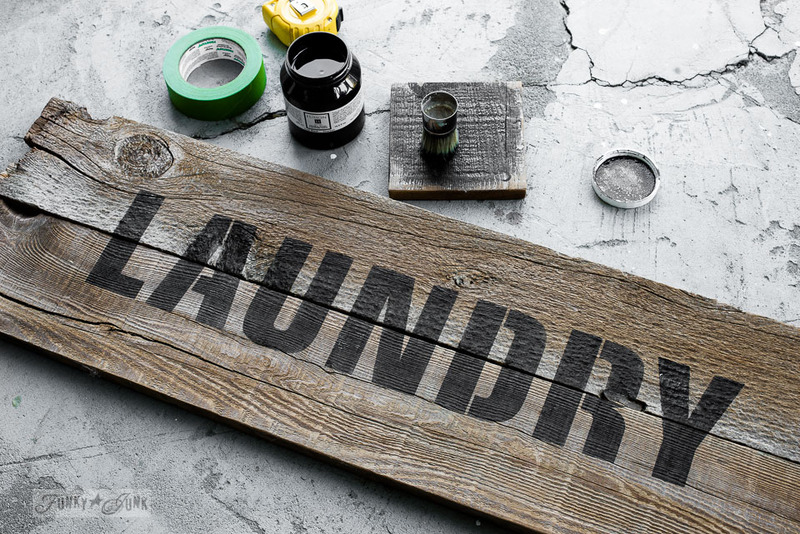 After paint is completely dry, lightly sand to distress with a palm sander if desired. Tip: No need to stand if you like the letters looking strong, or if you stencil uneven to begin with. But if you do, make sure your paint is perfectly dry to avoid smudging. I used Fusion Mineral Paint’s coal black. 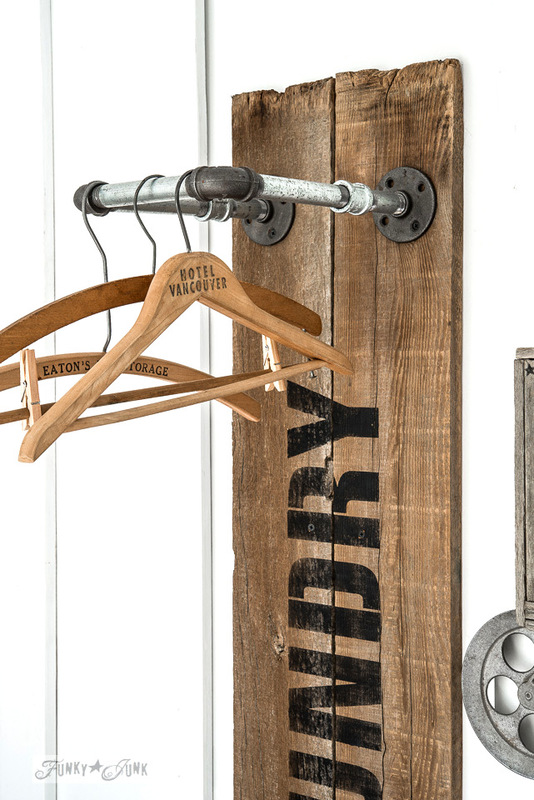 With a dry brush, it soaks into the raw wood perfectly, leaving super sharp edges, and dries nearly instantly. 6. Install boards by screwing directly onto wall. Each board was installed onto the wall as shown above, one at a time. They were not previously attached together. Use anchors if you don’t hit wall studs. 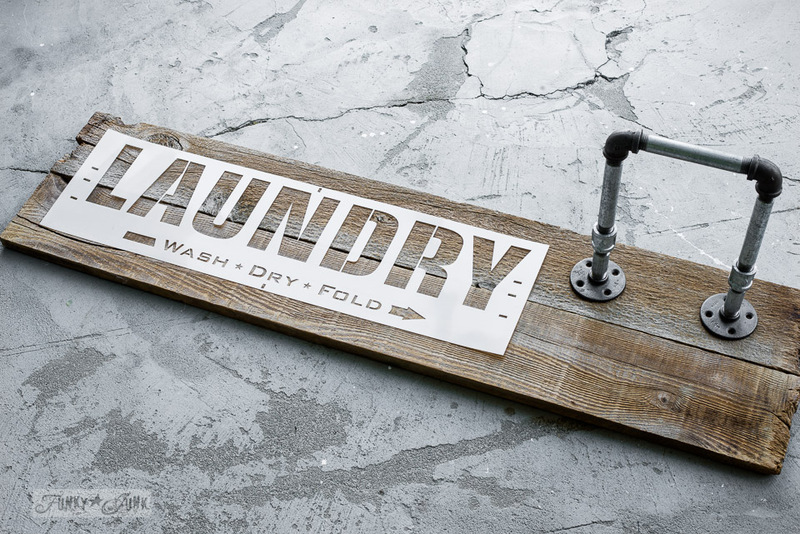 Or be sure to mount the LAUNDRY boards on other boards that do attach to the studs in some way. 7. Attach pipe fittings onto the boards. Connect all the pipe fittings first, then screw in one side with one screw. Then place a level across the top, while screwing in the 2nd side. Once straight, add more screws. How cute! And it works so great! But let’s have some fun with that stencil subtext now, for an unexpected twist. 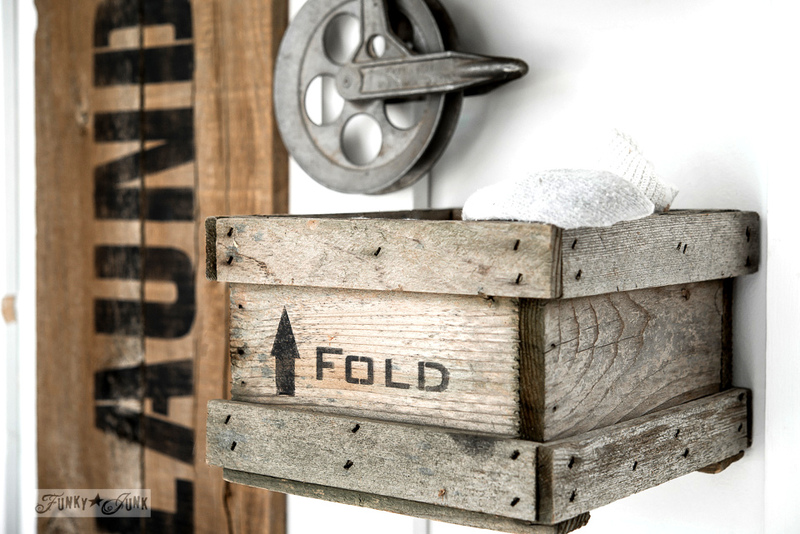 Two little crates were installed as shadow box styled shelves, doing a few helpful things. 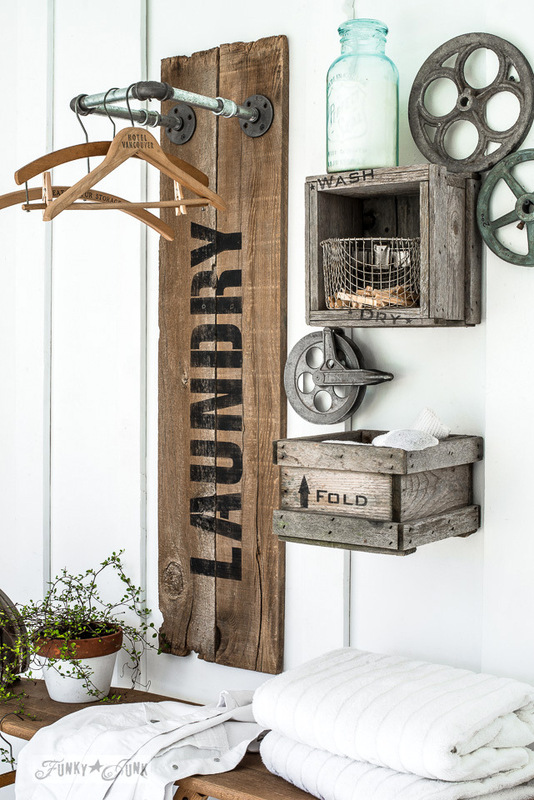 “Wash” showcases, the laundry soap inside the mason jar, DRY holds all the clothespins, and FOLD is the perfect little catch for the odd, lonely sock that is looking for its friend. 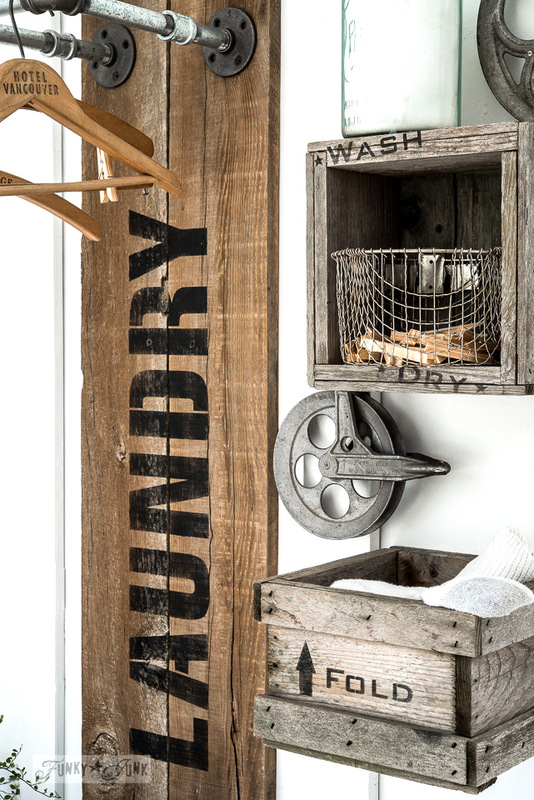 Putting the laundry instructions to use in an artful way was a fun challenge! 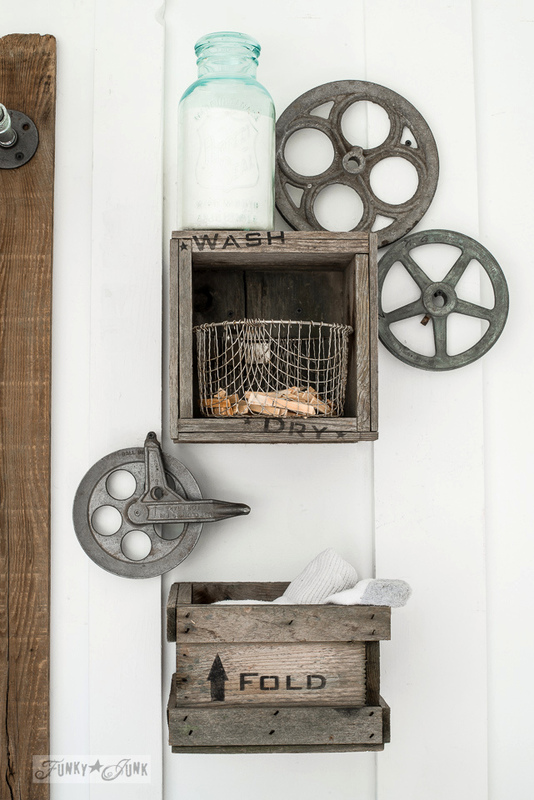 If you desire a true, crate feel with your stencilling, look for faded boards and crates as your backdrop, then stencil with an uneven hand. If it’s darker in some areas, and lighter in others, like a bit of a fade, it looks pretty natural! This is where a little imperfection comes in handy. Honestly, a collection of any one thing, as long as they are all slightly different, creates an interesting, artful grouping if displayed together. Which does not help curb my hoarding habit one bit. I also actually iron on an antique ironing board since I have only 4 in my stash. 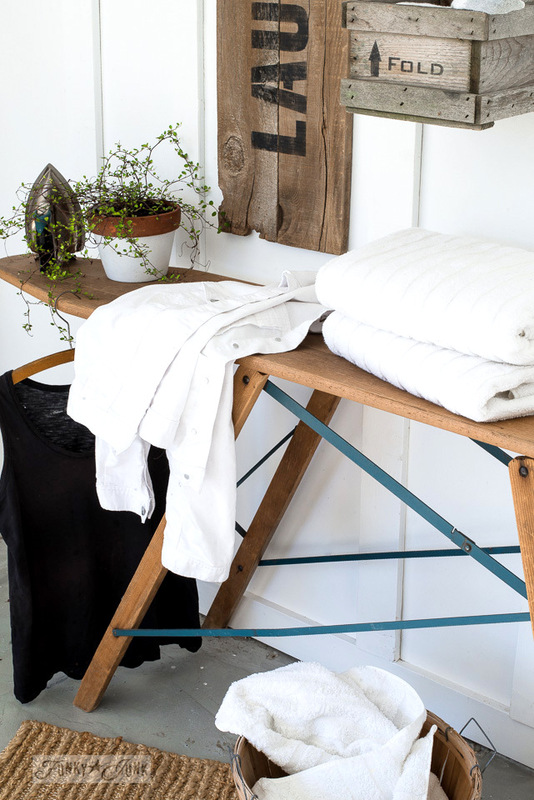 But even if you don’t, collecting these make instant, pretty side tables for any tasks that require a little extra space. Do you remember the desk top lamp I made from one HERE? Well Donna, or should I say Tren! You done gone and did it again! 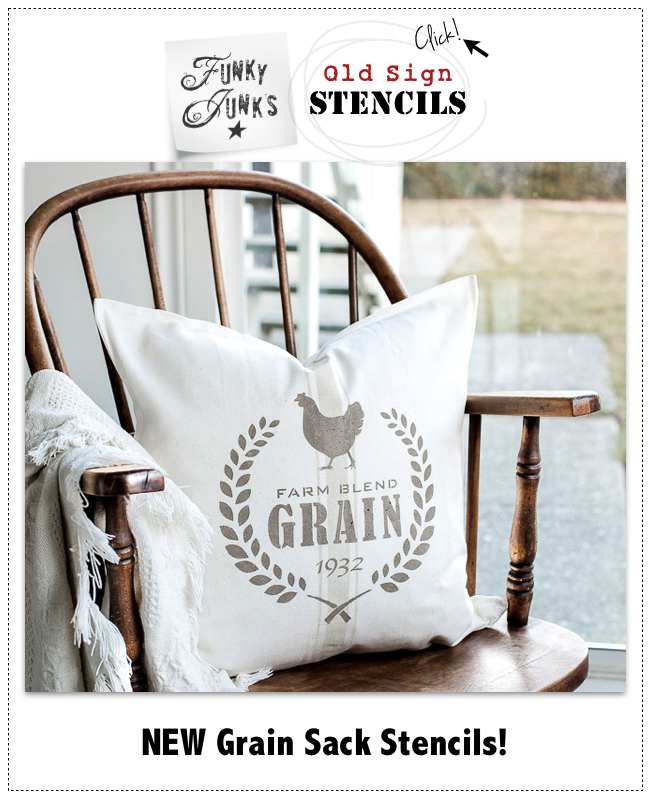 I love the stencil and your earlier pantry stencil from the other day. And I am so excited because I am off today and am going to a hardware store to browse. I know the wood and metal trend is hot right now, but I’ve liked it for a long time. I’m thinking that I am so in love with wood and it’s smell and look probably because my Dad was a carpenter and I’ve got fond memories of him always working on something. He would come home from work and smell like sawdust. Loved it. Thanks and here’s wishing you and your son a wonderful day! So great idea! Thank You! This is so cool and I love that hardware. 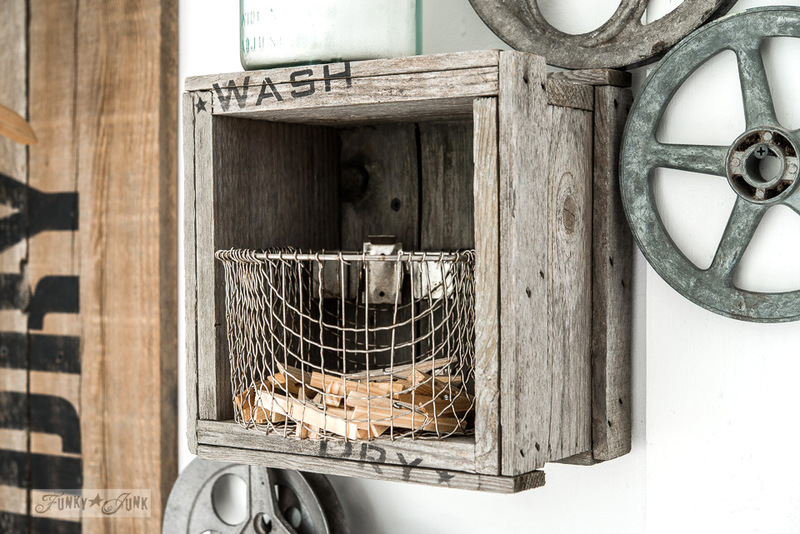 I’m thinking a neat wall box to put your laundry cleaners in would be neat too. Another fun stencil idea for the home. 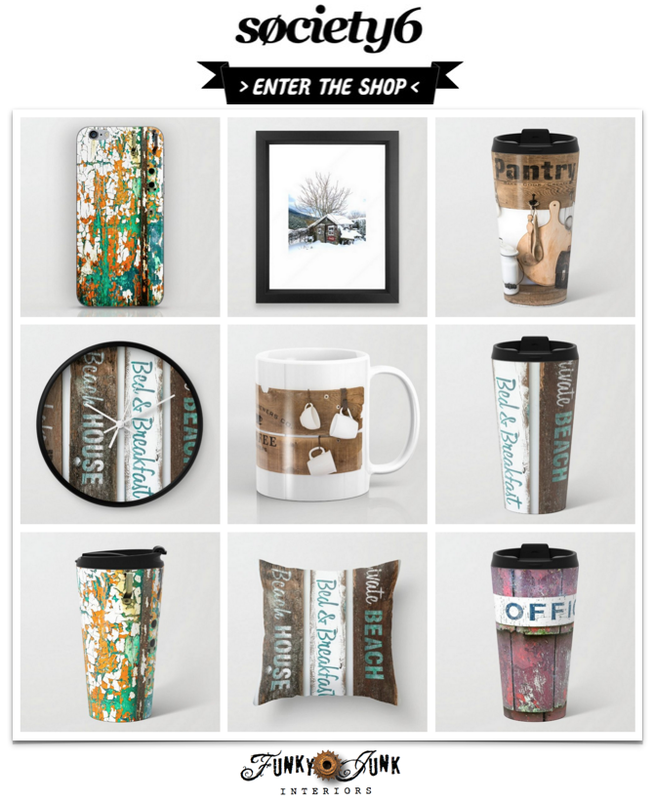 Love your creativity – it’s always the best. what an awesome display! 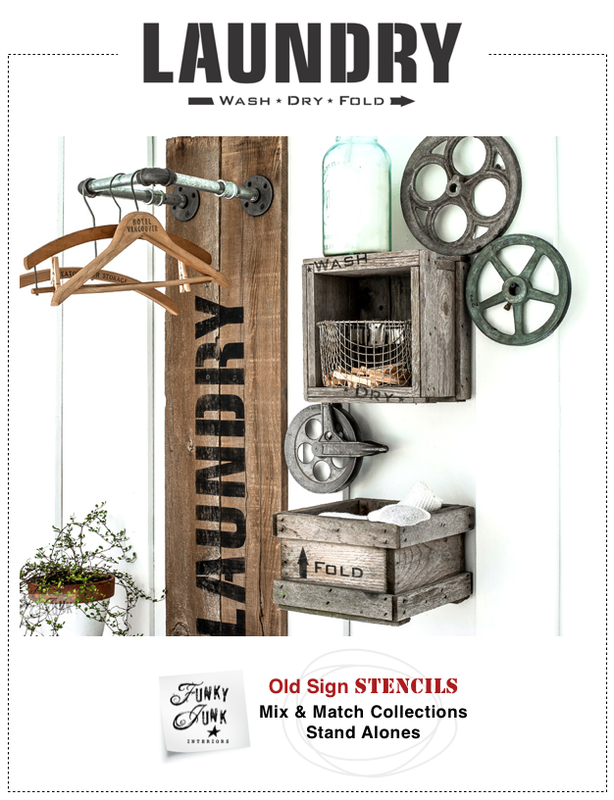 we’ve been on the hunt for an old laundry sign(no luck) to hide the breaker box in our laundry room…this will be perfect! Oh my goodness Donna, how creative and cute and handy as a pocket on a shirt. You never cease to amaze me with your creativity and love your thought process, and the way you make it happen. 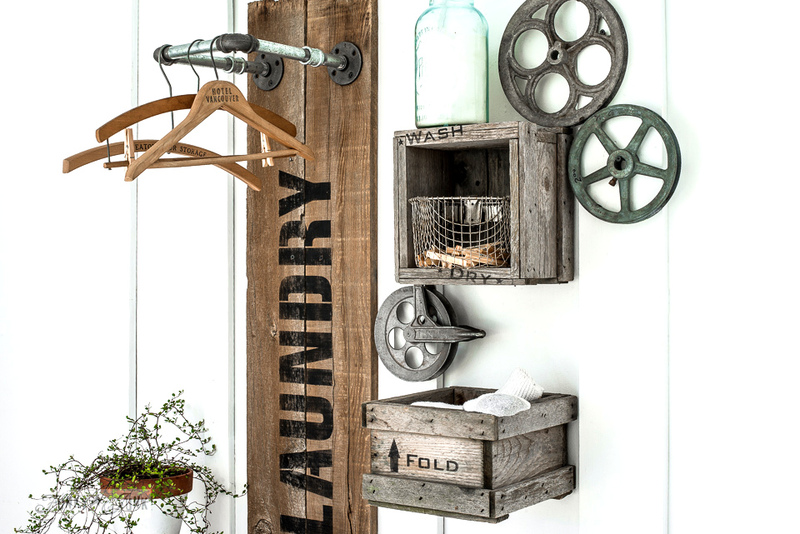 My laundry room is in the basement and this would look so cute down there and I have plenty of wall space for it. Donna – totally off subject. On instagram on The Dodo there is a cat sanctuary in Hawaii on an island with 500 cats. Please visit it next time so I can live vicariously through you! Oh my goodness…. I just looked it up. It’s on the island of Lanai and requires a ferry ride. I will keep this in mind next round! That would be so cool to see, thank you! 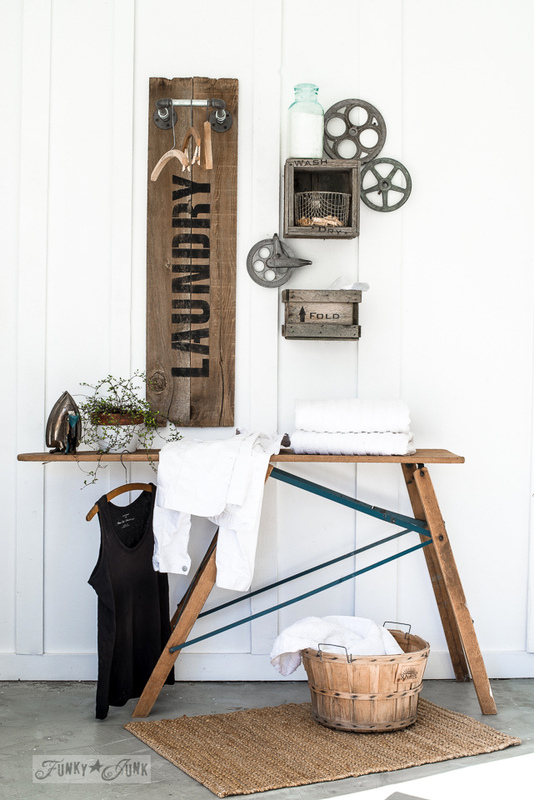 Love your laundry room display! 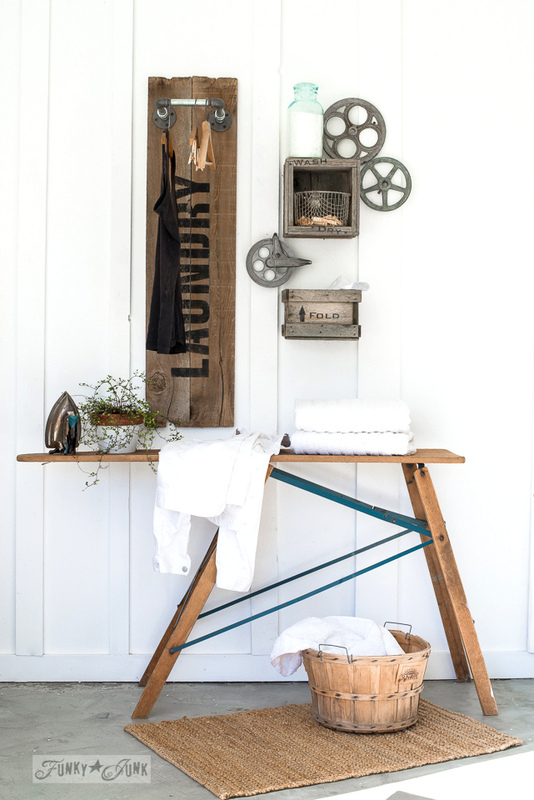 I use an antique iron board to iron on too. 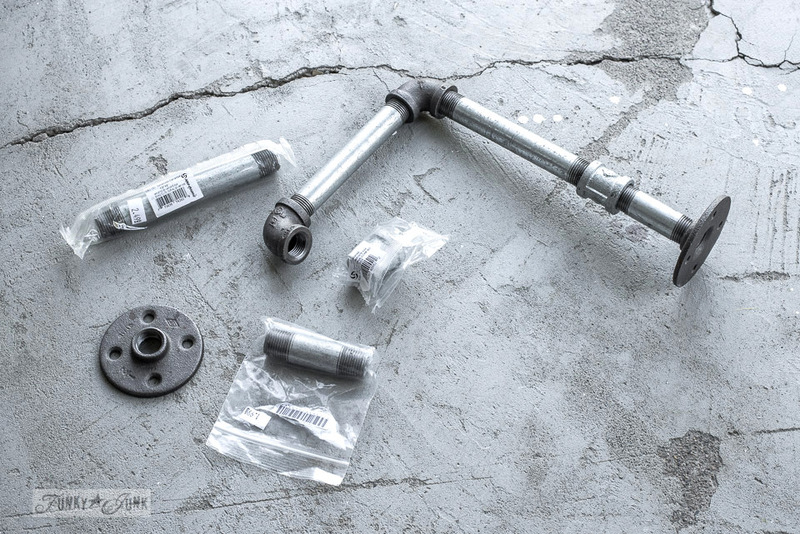 This may be a dumb question…..
What are the length’s of the pipe that you used. There are 2 different length’s. I love this!! Oh gosh Lorie, sorry, it’s already taken apart and the pipes were used for another project. 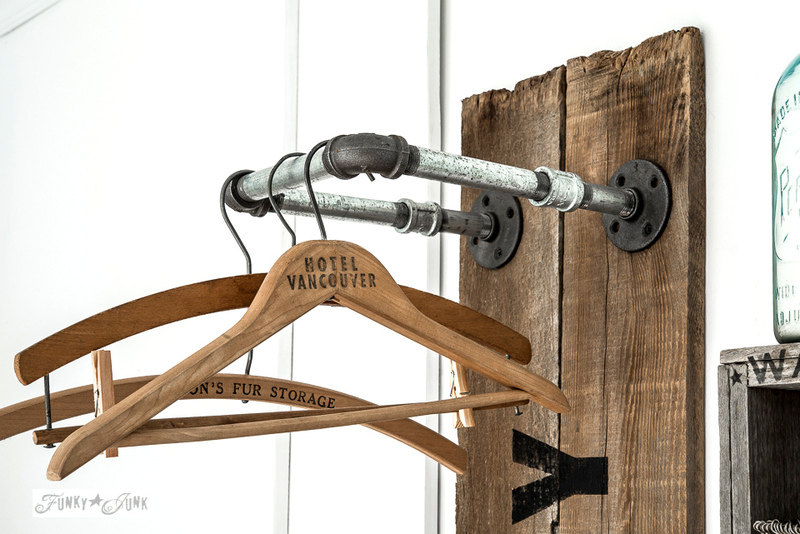 I suggest to go pipe shopping with a hanger in tow, so you can get the right length to work with what you have. It’s really that easy. Happy pipe shopping and sorry for my delay in replying. These are great!! I have just used the same idea to create some stencils for our new boxes in our store. 🙂 Thanks!!!! I am wondering did you connect the boards together before you put it on the wall? Or did you just put them side by side put the stencil on the wood then hung the boards separately? 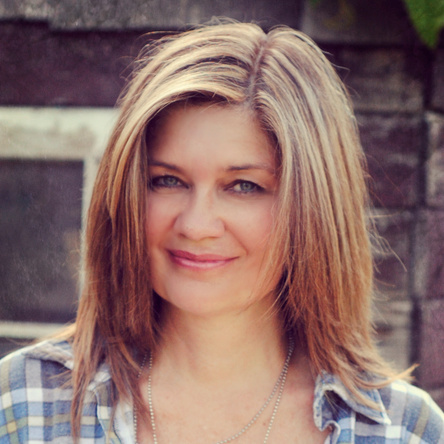 Hi Lori, sorry for the confusion. Each board was installed onto the wall, one at a time. They were not previously attached together in any way. I’ve added this info to the post to better clarify. Thank you! 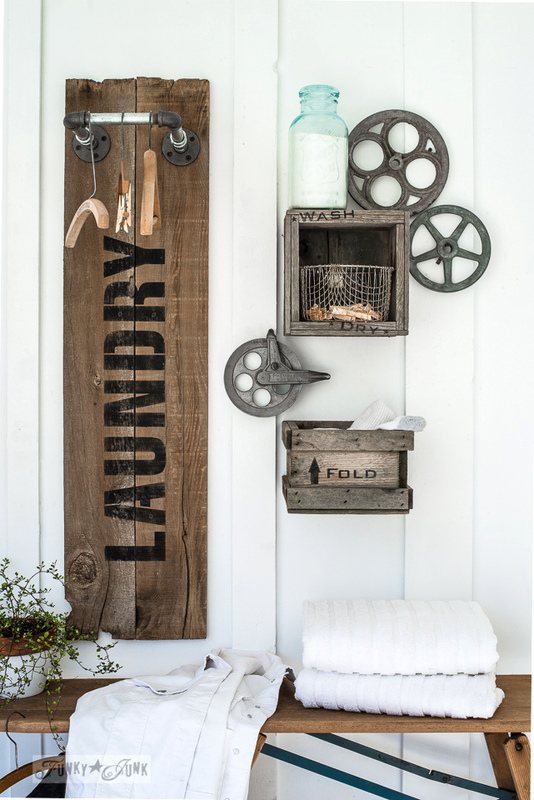 ABSOLUTELY LOVE this laundry sign and arrangement…now I need to find someone to do it for me. Thanks for sharing.